The great thing about having a dog is you get outdoors no matter the weather. With Nelly as inspiration and me as guide, Nelly and I explored the dog parks and walking trails in our neighbourhood this winter. 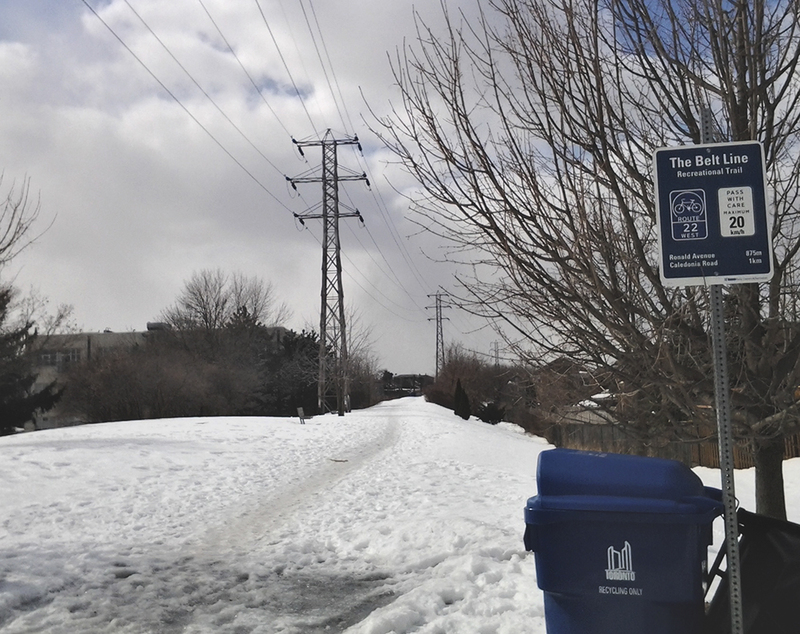 At Allen Road, north of the Eglinton subway are two belt lines. The Kay Gardiner Belt Line runs east towards Mount Pleasant along lovely backyards of pretty homes. The tree-lined trail is straight and paved, popular with joggers, cyclists, strollers and dog walkers. These graffiti are found on a building at the Fairbanks entrance to the belt line. Note the house section of the boat. Those are doors that jut out of the building. See how the artist(s) cleverly incorporated tree stumps and loose planks into the painting on the wall. There are rest areas along the trail. I have sweet associations of this trail with Nelly. Walking here on one snowy day, Nelly ran circles around me every time I made kissing sounds at her. After a few rounds, she sat at my feet and waited for a treat. Wouldn’t budge until I gave her one. She did this several times. I wondered after what she thought she had done to earn a treat, or was she training me to do something that I hadn’t clued into? On this same day, Nelly also showed me what a happy dog dance looked like. I have now seen a dog prance with abandon and swim with glee in snow up to her shoulders. “So happy,” a man walking by said. That was the understatement of the day. At Davenport and Christie is Hillcrest Park, up on a hill. We enter the off-leash dog area from Conrad Avenue on the north side of the park. This park also has a dog fountain. The dog area is corralled off with wooden posts and wire fencing. 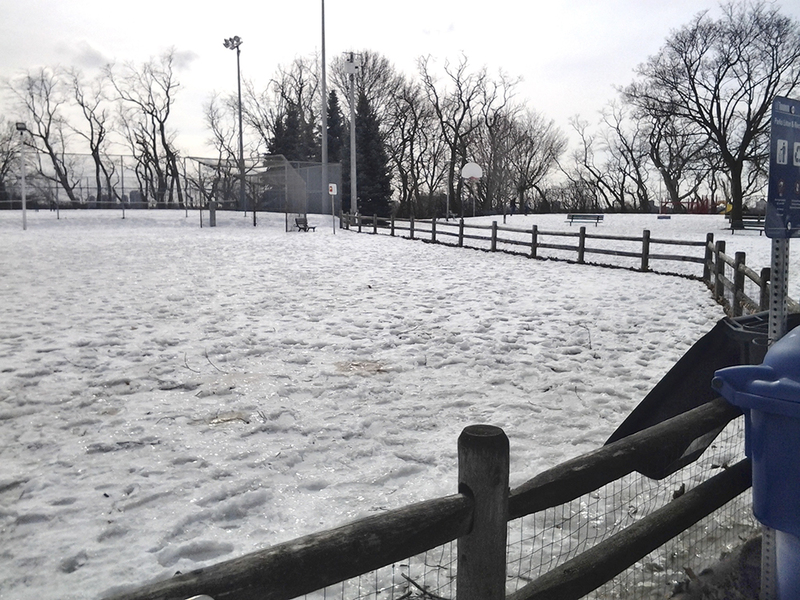 While the tennis courts form the southern border of the dog park, the north side opens onto Conrad. Once, spooked by fighting dogs, Nelly fled onto Conrad and disappeared. Her family feared she was lost. Fortunately, they found her hiding at the end of a driveway. In this park I met a woman in running gear one day. I thought Nelly was playing with her dog while we chatted. But she said she didn’t have a dog. She often jogs by and stops to pet the dogs because she misses hers in Winnipeg. It never occurred to me that non-dog owners visit dog parks out of longing for their dogs back home. North of Vaughan Road at Humewood Avenue is Cedarvale Park. The large dog area is entirely fenced in within the beautiful grounds. 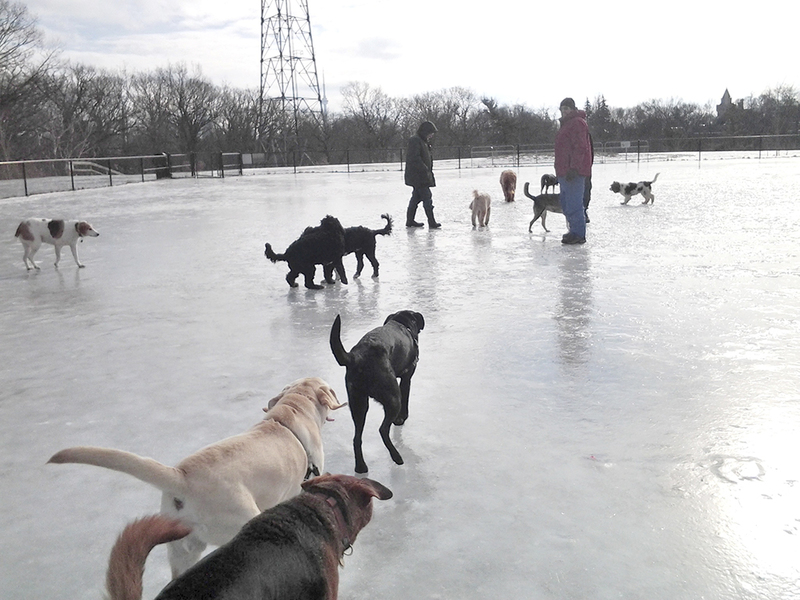 Cedarvale dog park is popular with commercial dog walkers who bring their pack charges on tangled leashes. Once, I saw someone unload a truck full of dogs in the Phil White Arena parking lot to take them up to the off-leash area. The first time we came to this park, a young man joined the dogs to play with them. He kept saying how cold it was. After a while, he left. On his own. Without a dog. A few weeks later, I saw him playing with the dogs again. I asked him which was his dog. He said he didn’t own one. “I just come here to see the dogs,” he said, and ran off after one. Another dog park visitor without a dog! I wonder if I will turn into one of them. 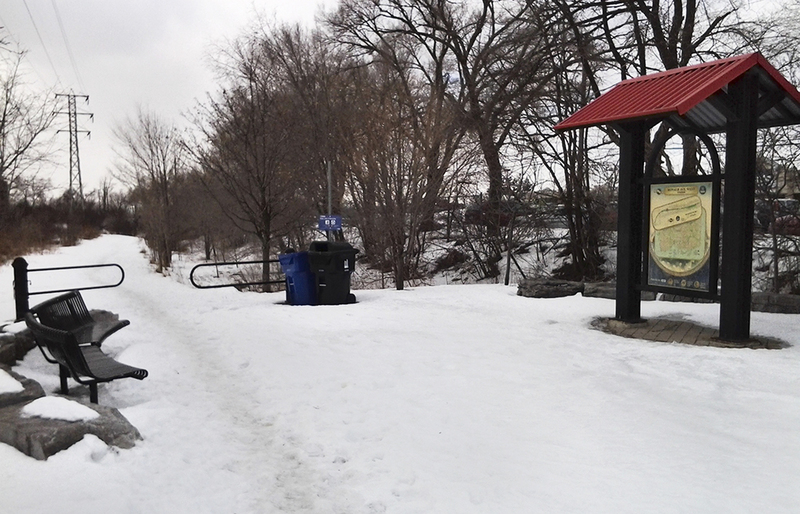 The park path east leads into Cedarvale Ravine where a trail runs down to Heath Street behind the St. Clair West subway station. The trail follows a little marshy creek that makes trickling sounds in summer. This trail is truly a precious little piece of nature in the heart of the city. I breathe deeper every time I walk this trail. Some sections make you forget that in a few minutes, you will need to navigate the traffic on Bathurst to cross the road. 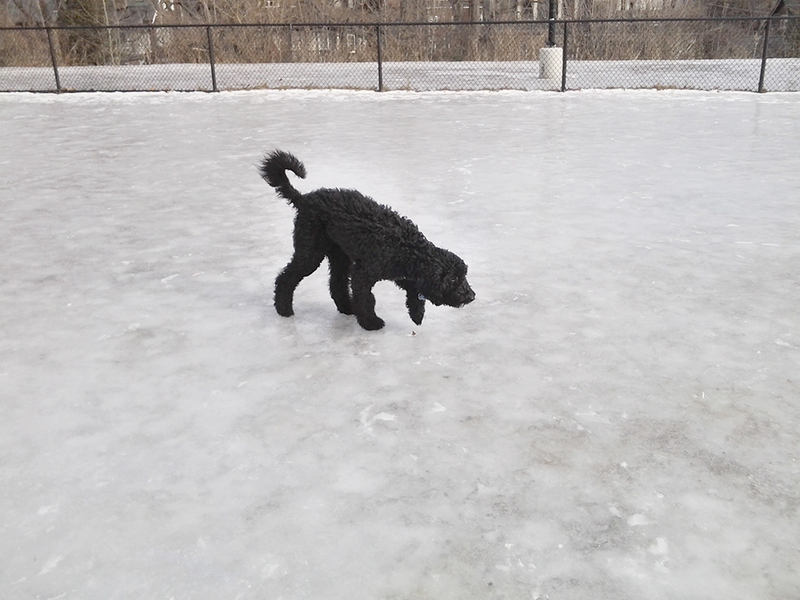 One cold winter’s day, Nelly and I went slipping and sliding across the icy grounds of Sir Winston Churchill Park at St. Clair and Spadina to get to the fenced in off-leash dog area, only to find the grounds of the dog park also a shiny sheet of hard ice. Sir Winston Churchill Park also allows commercial dog walkers to bring their charges there to romp. I saw many dogs and their walkers huddle, come apart, make formations to brace against the wind, and balance across the slippery ice like a ballet rehearsal. It was so windy that cold day. Poor Nelly. We left after a short stay. 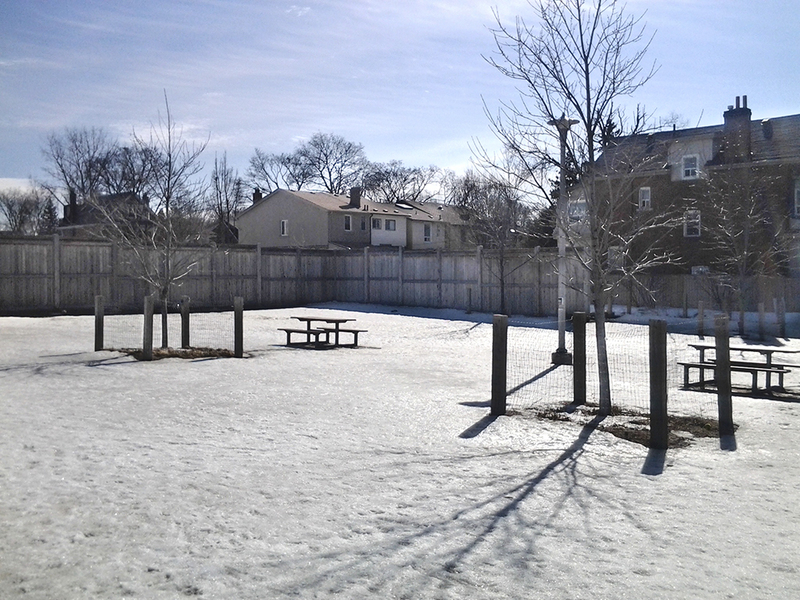 South of Bloor Street at Christie, Bickford Park sits behind The Toronto District School Board’s Bickford Centre. 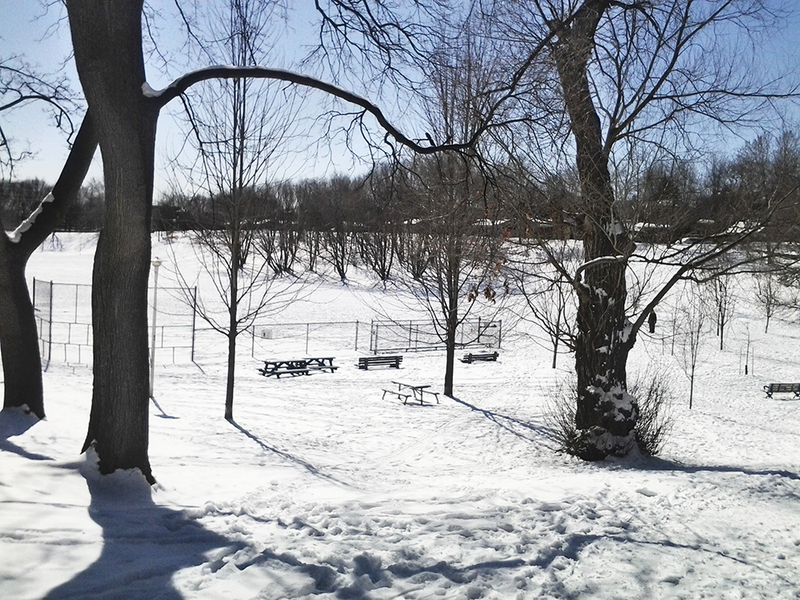 The park dips below ground level; it is cradled by tobogganing hills. Only the section next to the building is an off-leash area. Signage tells you this is a pilot green dog park. A box on a post invites use of free, non-plastic poop bags. But in the winter months, the box is empty. In summer, I’ve seen sports games held in the field of this park. But in winter, this is a great park for slow jogs around the sunken perimeters, with Nelly bouncing close by. This is a very good read. Makes me wish I too had a dog. But alas, I am dog-less. It’s wonderful that there is so much green space in the city. What a lovely article. Good writing, good photography, great romanticism. Too bad the thugs, who unleash their dogs on our front lawns in downtown Toronto, won’t read it.